If I recall correctly, @Pginer-WMF's designs called for "mark as read" to be an option in the dotdotdot menu, but right now it doesn't appear there. For mark as read: we are using the "check" icon, a tick mark to indicate completion. Catrope added subscribers: Catrope, Mooeypoo, Pginer-WMF. Assigning to Pau for clarification and icon assets. Initially we were a bit hesitant to add the "mark as read" action because it was a bit redundant, but from what we have seen in the testing sessions it seems it can be convenient to anticipate that there will be a "mark as unread" once the notifications became read. So I think it make sense to add it. Pginer-WMF moved this task from Product/design work to Ready for pickup on the Collaboration-Team-Archive-2015-2016 board. Just a note: At the moment, secondary actions do not have 2 lines (title + description) so the commit that I submitted only has "mark as read" without the second explanation line. If we want to add the functionality of second line / descriptions for these links, we should have it as another ticket and discuss the full behavior -- one question, for instance, is whether all secondary actions will have an explanation line or not? Would thinks look different between having one and not having one? We already have infra for this in the presentation models, it's the 'description' field in the secondary links array. I believe it's empty for all existing secondary links. We'd just need it to be rendered by the frontend code. 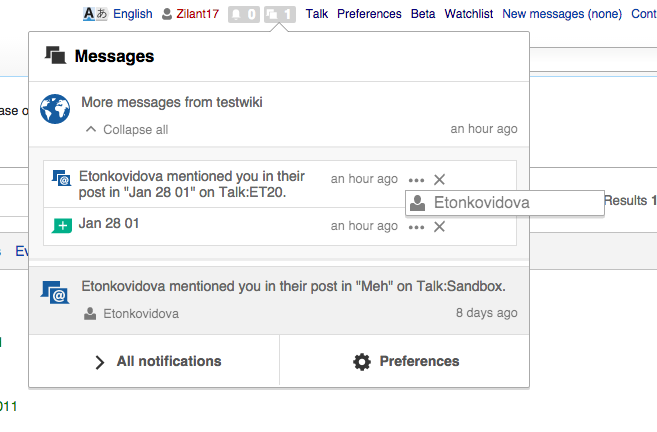 Re-checked in betalabs - clicking on 'Mark as read' marks the message as read. Other links do not work - T125160: cross-wiki notifications: the secondary action links - User page and Flow board - do not work. the styling of all elements in the fly-out menu looks pretty different than in your designs. we can use secondary text to describe these options if we need it (Roan says there is the facility), but will need consistent language and design. Is there a separate ticket for these? If not, do you want to create one? Thanks @Pginer-WMF . I moved T126734 to the current sprint.